The Path to Great Culture got in touch with Partner Digital to build a WordPress website that showcased their brand new business. 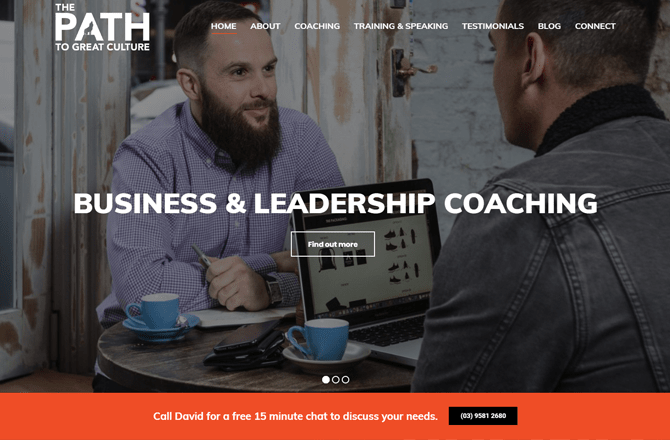 The goal was to create a very polished website that matched the highly energetic, bold, and personalised coaching and training they offer. Tom and his team at Partner Digital are truly outstanding. Methodical, customer oriented and topped off with an outstanding and creative visual eye. Always responsive and understanding. Professional and talented. Tom helped bring my goal and dream to life. He was patient and shared my vision. It didn’t matter that I was based in Melbourne and he was in Queensland. His approach truly transcended our locations. We grew a strong rapport and the results speak for themselves. Best money I have ever spent. I will use him again and again.